On third and 15 with the clock winding down, all senior quarterback Eric Miles could do was heave the ball. So he did. Lucky for him, it thudded right into the chest of Bryson Bell. Miles' pass from 43 yards out couldn't have hit the junior wide receiver more perfect as the playmaker catapulted above a sea of white jerseys to catch the ball and wrestle it away from an Anderson County defender. Bell's eyes were on the officials as he came down. After a long pause, Bell and the Knights got the call they needed. Touchdown Knights. Seven seconds to go. The Lebanon Middle School eighth grade girls' basketball team will be one of 32 teams vying for the Kentucky Basketball Academy state tournament title this week. LMS won the tournament last year, according to Head Coach Trent Milby. Four players from last year returned to this year's squad. LMS finished the regular season unbeaten at 26-0. The conference tournament began for the girls on Monday and continues on Thursday. The tournament is being hosted by LMS as they are the top seed. Next Monday is the championship game of their conference tournament. Earlier this year, Renee Schooling was speaking to a class at a local school about nutrition when a student walked in with a bag filled with soft drinks and candy. Schooling asked why he had the bag, and the student replied that it was his reward for being student of the month. Schooling, a cardiovascular school nurse with the Lincoln Trail District Health Department, shared this story during a Marion County Board of Education meeting last month. I spoke with Jo-Ann van den Berg-Ohms from Van Engelen Bulb Company the other day. Her family has been in the Dutch bulb business for five generations so I trust her advice when it comes to bulbs. She noted that bulbs are best planted once soil temperatures cool to about 55 degrees, so she tells people to wait and plant bulbs until we have had at least two weeks of sweater weather. If it is too cool outside without a jacket then it's just right for planting bulbs. Kim Wright once said she would never marry a farmer. But that was before she met her husband, Wesley Wright. They were first introduced in the McDonald's parking lot in Lebanon. After seven years of dating, Kim and Wesley married. Last month, Kim, Wesley and their five-month-old son, Isaac, were named the Marion County Farm Bureau's Outstanding Young Farm Family. Wesley said he was surprised that his family was chosen for the award. Marion County voters will be voting for state, federal and local offices today, Nov. 4. 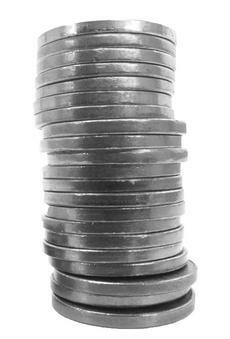 The “recallable nickel” will also be on this year’s ballot. The polls will close at 6 p.m. Nov. 3 was the last day to cast an absentee ballot in person in the Marion County Clerk’s office, 223 N. Spalding Avenue, Suite 102, in Lebanon. The applications for a mail-in ballot had to be requested by yesterday. Voters in the Loretto and St.
Missy Luckett, the owner of Missy's Out of the Way Cafe, lost her home to a fire Friday afternoon, Oct. 31. The house was located next to her restaurant. No one was injured in the fire, and the restaurant was not harmed by the blaze. 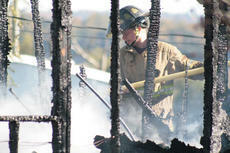 At 3:17 p.m., the Lebanon Police Department received the report of the fire at 860 Horseshoe Bend Road in Raywick. A 35-17 lead in the second half turned into a 39-35 deficit in the fourth quarter for the Knights on Friday night against Anderson County. Bryson Bell's end zone catch with seven seconds remaining would put the Knights up for good, 42-39. Bell and quarterback Eric Miles connected on the Hail Mary play on third and fifteen. 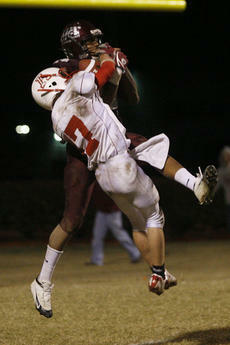 Bell made the catch over several Bearcat defenders and wrestled for the ball while falling into to the end zone. Marion County faces Green County next week on the road in the final regular season game. St. Charles Middle School Principal John Brady is convinced that renovation can make a difference. Two years ago, his school underwent a $7 million renovation. Earlier this week, Marion County High School students participated in a mock election. Students were asked to cast ballots for president, U.S. Senator and U.S. Representative and to indicate what issues are the most important to them in this election. The MCHS mock election was held Monday, Oct. 27, and 845 ballots were cast. The Obama/Biden ticket won 56 percent of the student vote. Democrat Bruce Lunsford received the most votes in the U.S.